With international guest numbers reaching over 161,000 and more than 3,000 exhibitors showcasing their products and solutions, this year’s record-breaking InnoTrans trade fair has once again proved to be the driving force of the rail sector. The four-day event closed on 21 September 2018 leaving behind very satisfied exhibitors and trade visitors. The organisers have reported that all available space was occupied within the Messe Berlin exhibition grounds, where 3,062 exhibitors from 61 countries presented their products and services for the public transport mobility sector. These included more than 400 innovations, 155 world premieres and no fewer than 155 vehicles. During the trade visitor days, 161,157 international guests came to Berlin, of which 153,421 were trade visitors from 149 countries. On Tuesday 18 September 2018, several prominent industry leaders took part in the opening of InnoTrans: Violeta Bulc, EU Commissioner for Transport; Andreas Scheuer, Germany’s Federal Minister of Transport and Digital Infrastructure; Jürgen Fenske, President of the Association of German Transport Companies (VDV); Dr. Richard Lutz, CEO of Deutsche Bahn AG; Henri Poupart-Lafarge, Chairman of the Board of Directors and CEO of Alstom; Laurent Troger, President of Bombardier Transportation; and Michael Peter, CEO, Siemens Mobility GmbH. These experts took time to analyse the rail sector and discuss how innovation, multimodality and sustainability are all key to rail’s successful future in mobility. Numerous exhibitors took advantage of the Messe Berlin’s rail tracks and outdoor display area, with a number of rolling stock presentations and world debuts, including the Stadler and Siemens showcase of the new S-Bahn Berlin, Stadler’s new Traverso FLIRT trains to be operated by Südostbahn (SOB) in Switzerland, and Bombardier’s TALENT 3-type Cityjet train for ÖBB in Austria. Also on display was the Deutsche Bahn and Siemens Mobility DB Regio Ideas Train – a life-size model of a double-decker coach on display that has different zones with different digital technologies integrated, specially designed to create an exciting but comfortable travel experience for passengers. During the trade event, the ‘InnoTrans Convention’ took place which has become firmly established as an international meeting place for top decision-makers from the business, political and transportation communities. Organised by the German Transport Forum (DVF), the Association of German Transport Companies (VDV), the Association of the European Rail Industry (UNIFE) and the German Railway Industry Association (VDB), just some of the topics under the spotlight during this year’s ‘Dialog Forum’ included ‘Railway Transport 4.0’, climate protection, digitalisation in rail freight transport, ERTMS becoming the backbone of the digital railway, and how digitalisation is changing public transport. Deutsche Bahn AG also hosted its ‘DB Innovation Forum’ to focus on ‘shaping intermodal mobility together’. Speakers involved included Sabina Jeschke, Board Member at Deutsche Bahn AG; Rolf Härdi, CTIO at Deutsche Bahn AG; Philippe Citroën, General Director of UNIFE; Jürgen Mues, Board Member at SBB Cargo; Dr. Ben Möbius, General Manager of VDB; Hans Peter Lang, CTO of Deutsche Bahn AG; Carlo Borghini, Executive Director of Shift2Rail JU; Dr. Josef Doppelbauer, Executive Director of ERA and Prof. Dr. Nils Nießen from RWTH Aachen. Making its debut at InnoTrans this year was the four-day HackTrain Hackathon where approximately 80 developers took part to demonstrate how the rail industry could be revolutionised by smart IT solutions. The first prize was awarded to the three-person team named ‘Veggie on Rails’ which, according to the judges, “showed an excellent understanding of the client’s needs” in coming up with the best solution to the task presented to them by the UK’s Network Rail – What is the best way of monitoring trackside vegetation at risk from the weather? In a highly cost-effective way the Veggie on Rails concept analysed existing video recordings and combined them with GPS data and a way of classifying the growth of particular types of vegetation. It was great to see so many of Global Railway Review’s existing clients and authors, plus new contacts, visit our stand at this year’s show. 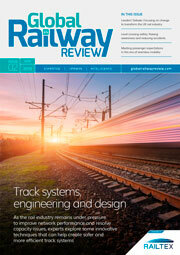 We were also thrilled to have a large number of people sign-up to start receiving printed and digital copies of future Global Railway Review issues. With a lot of ground to cover during the trade fair, there were many sights and sounds for us to take in, but the key take-aways for us from our attendance was understanding the importance of the rail industry to cooperate further, how valuable knowledge-sharing is, and the huge potential there is for innovation in the industry. In a post-show report by InnoTrans organisers, many key industry experts took the opportunity to provide comments and feedback of their 2018 event experience. Jürgen Fenske, President of the Association of German Transport Companies (VDV) said: “This year, with more than 3,000 exhibitors and a wealth of rail technology innovations, InnoTrans showed that public bus and train services are becoming more and more important. In Germany more than 10 billion customers make use of local public transport every year. Political decision-makers, who also attended InnoTrans in large numbers, have generally accepted the pivotal role of public transport in protecting our climate and maintaining clean air. The fair showed us once again that passenger and rail freight services stand for modern and sustainable forms of transport that can continue to grow providing political decision-makers target innovative and environmentally-friendly transport throughout. InnoTrans will return to Berlin on 22-25 September 2020.